You should also note Opera, Vivaldi, Brave and a range of lesser-used browsers are based on the same Blink rendering engine which is developed for Chrome and Chromium. Are we heading uncontrollably toward another monoculture? The monopolistic vendor has less incentive to innovate. The vendor becomes too powerful and can dictate web standards. Their refusal or lethargy for implementation can kill a technology. A monoculture makes it harder for others to compete. Those vendors may abandon their own efforts or go out of business. However, the IE6 days were different. The early web threatened Microsoft’s shrink-wrapped software model, especially since Netscape claimed to be building a web-based OS (the reality was more than a decade away). Microsoft entered the browser war and killed competition with a free browser which was significantly better than others available. The result: IE6 gained a 95% market share. Microsoft halted further development and retreated to web-enabled Windows and Office software. Today, Google’s primary revenue stream is web-based services. The company has no reason to abandon browser development, because they depend on the web. A better browser permits better web applications, which compete better against Apple and Microsoft products. Google has an incentive to work with other vendors and support standards, because it allows their services to work everywhere regardless of browser or device. Web developers then benefit from increased cross-browser compatibility. So is the Chrome monoculture harmless? I’m yet to be convinced. Competition is good, and Google’s influence could be considered too powerful. Fortunately, there is a wide range of browsers available, and newer vendors have not been dissuaded from entering the market. That said, I urge you to look beyond Chrome and consider alternatives. All the mainstream browsers are excellent. Don’t believe Chrome is always ahead or accept the monoculture, because it makes your life a little easier. So, wondering what you could switch to? Perhaps Blisk is your next web development browser? Or perhaps Vivaldi? After a huge 2.25% jump in mobile traffic last month, usage dropped 1.95% in June and now accounts for 43.86% of all web activity. UC Browser appears to have dropped by an unprecedented 6.25%. There is an explanation: some versions of the browser were incorrectly sending an additional page view for every valid request. 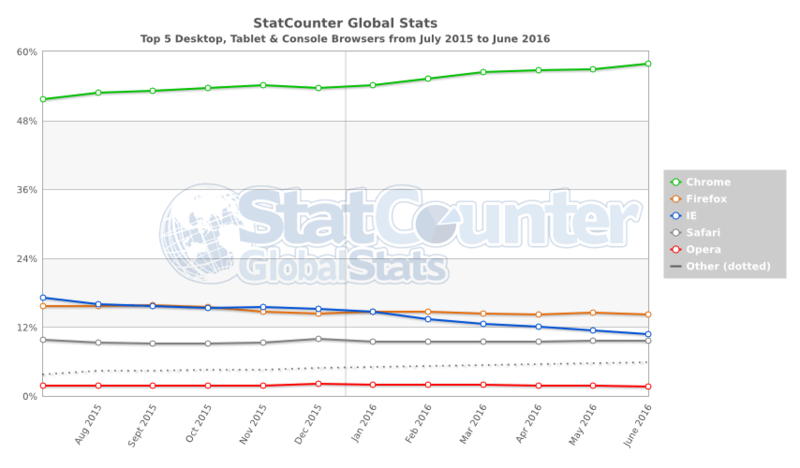 StatCounter has adjusted for the double-counting, which explains why Chrome and the iPhone increased while the mobile/desktop ratio decreased. That’s the sort of nonsense you need to deal with when collating browser statistics! The rest of the chart saw few dramatic changes although Samsung Internet continues to make good gains. See you next month.